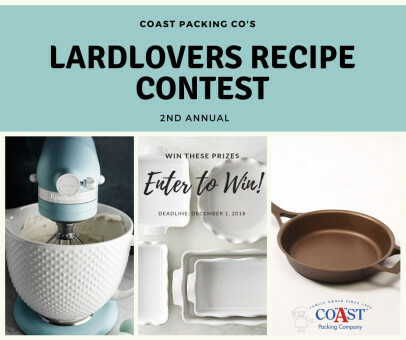 That yellowing family recipe stashed in a bottom drawer could be your ticket to some choice kitchenware and lasting lard fame, as Coast Packing Company, the West’s largest supplier of healthy animal fat shortenings, prepares to wrap up the second annual #LardLovers Recipe Contest. Coast has issued a call for any unique, unpublished recipe that uses lard (think pie crust, special bread or cookie recipe, fried chicken concoction, holiday tamale surprise, etc.). Entries, which have been accepted online since Nov. 7, must be received by midnight Saturday, Dec. 1. To enter, contestants can use the online form posted at http://www.coastpacking.com/lardlovers. Alternatively, entries can be submitted via Facebook. The #LardLovers Recipe Contest winner will be announced in tandem with the first official observance of #NationalLardDay, December 8 — a celebration of a traditional healthy animal fat, pure lard, derived from pork. Authentic animal fats like lard are now enjoying a resurgence within America’s food culture, in restaurants (especially those featuring ethnic specialties), fast food operations and home kitchens. Artificial trans fats are out, and minimally processed animal fats like lard — for superior baking, frying and a host of other cooking applications – are making a comeback. All submissions are posted on the Coast Packing website, where fans will help choose the finalists by voting for their favorites among the individual recipes, accompanied by images of the resulting dishes. Based on the tally, the top 10 vote-getters will be posted on the Coast site. Coast’s judging panel will then prepare the top recipes and choose three winners based on flavor, creativity/originality and visual appeal. Winners will be announced on December 8, the first National Lard Day. The contest is open to those 21 and over, and no purchase is necessary to enter.